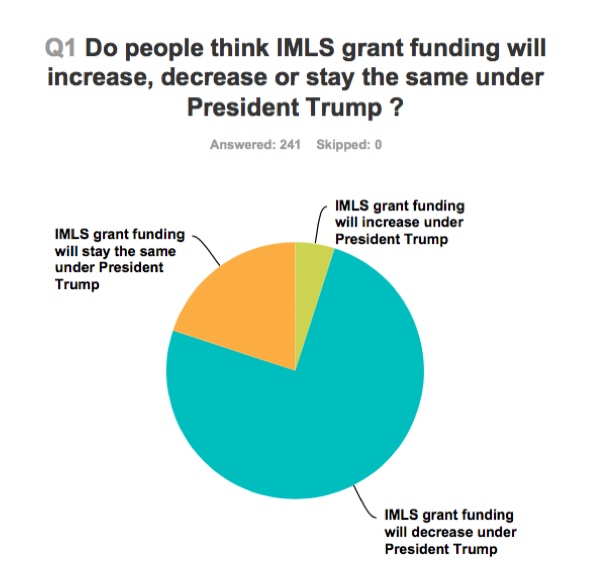 Survey Results, Received 241 Survey Responses. I think that more visitors will go to museums *if* their content becomes more progressive. As the stock market fluctuates, corporate cash donations will lower, while physical donations will increase as they look for bigger tax breaks. I think some brave, small, nimble museums will do amazingly progressive exhibits and programs. 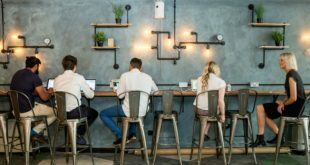 The bigger institutions will hunker down as their funding dries up and boards become more afraid. The Effect of Mr Trump becoming president will activate conservative powers, this will have effect on the progressiveness of institutions and have effect to progressiveness in art and culture in general. He has much bigger fish to fry. He will however look at cutting excessive spending, and the Federal government is where he will start. All of this is mere speculation. We don’t know that President-Elect Trump will even have museums on his radar. However, if taxes are reduced for those he says will be reduced there will be more funding available for museums. It is too early to tell. I prefer to take a wait and see stance. 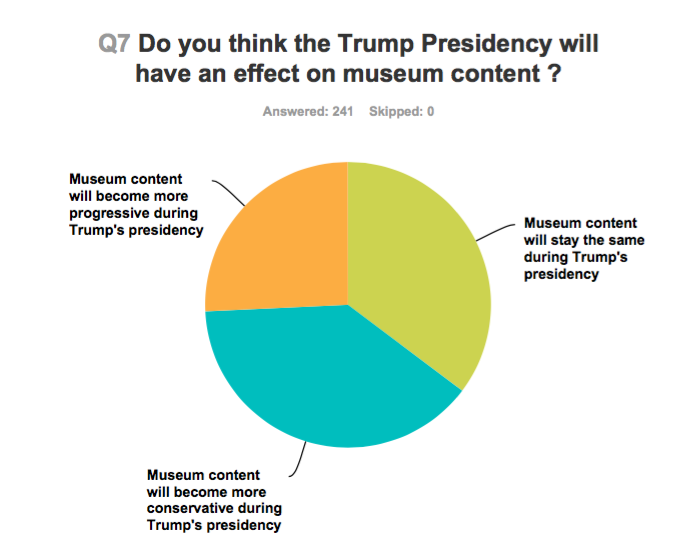 Museums will have more impact on themselves than the new administration will have on them. Trump does not show any interest for science, has a denial posture regarding climate projections, and a conservative vision of scientific matters and society. The scientific community has to organize an efficient resistance against foreseeable obscurantist and hard times. Unfortunately, at least 4 precious yours will be lost (or worse) for protecting the planet and its life, because of ignorance and cupidity. Trump has already made clear his intentions for raising taxes for low-income families and cutting taxes for corporations. Families with low incomes will be less likely to be able to make the journey to a museum because their financial resources will be lower. 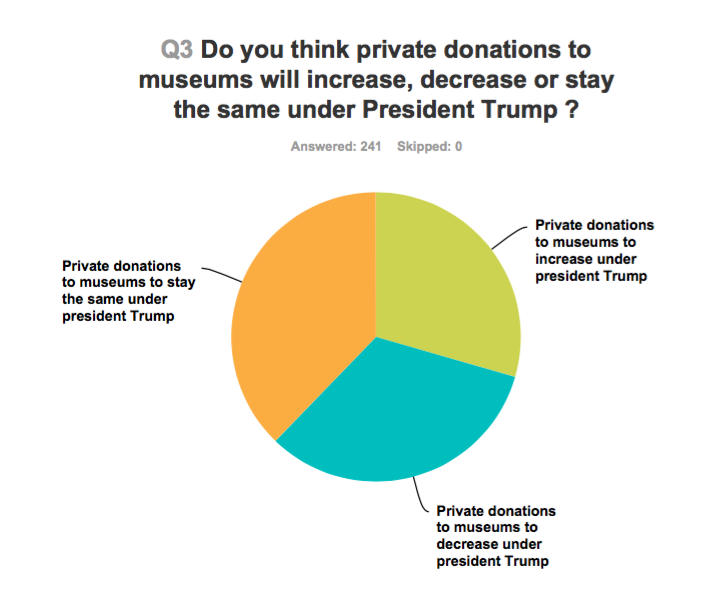 Corporations will be less likely to make donations to museums because they will no longer need the same tax breaks. 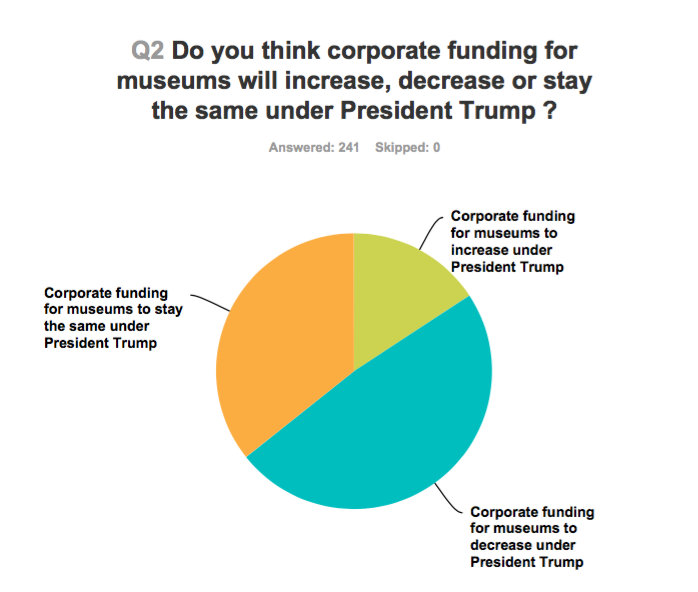 In addition, Trump’s plans for education will have a negative impact on museums because it is likely funding to schools will be reduced in a way that limits the ability of schools to access museums via field trips. If museums are able to maintain or expand school services, I foresee that there will be more trips to schools and more online interactions between schools and museums. I also foresee a drop in giving to museums on a private level because we are likely to go into an economic recession in addition to a cultural recession. 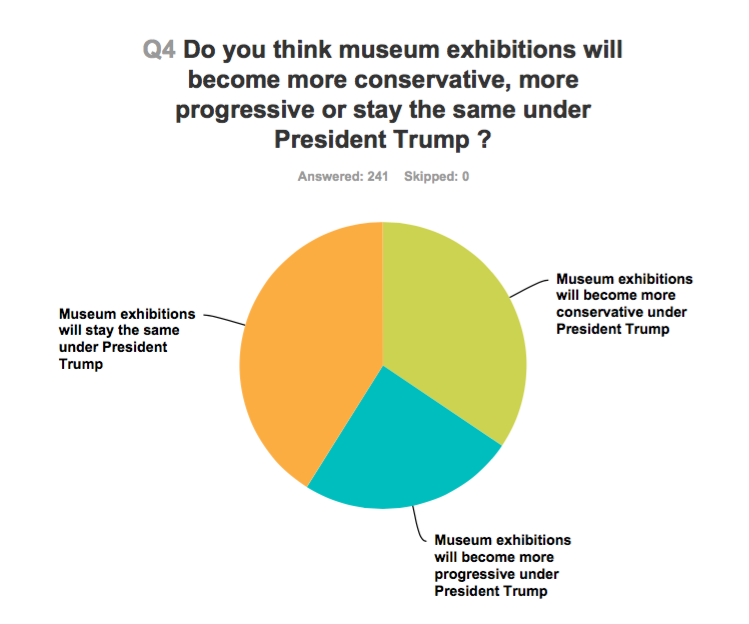 Although I do not think that museums will become more conservative, I believe that they will stagnate because they will not be able to get the funding in order to continue to be progressive. I live in Canada, so this was an outsider’s perspective. I cried my eyes out as the debacle was revealed on election night. Any concerns about museum programming seem trivial when thinking about the fate of the world with Trump as president. God Save America. Museum exhibitions and content will not be affected due to the Trump Presidency. The exhibitions and content will depend on the museum staff only and the considered interests of the museum visitors. I am hoping museum job opportunities will growth under Pres. Trump. Museums are about our connections with each other, with our environment, with our future. We operate from a place of inquiry, compassion, love, courage, truth. I believe and hope museums will stand up for the values they believe in and the communities that are a part of. Refined and sophisticated will become bad connotations, anyway I believe in the intellectual integrity of people in the cultural field. 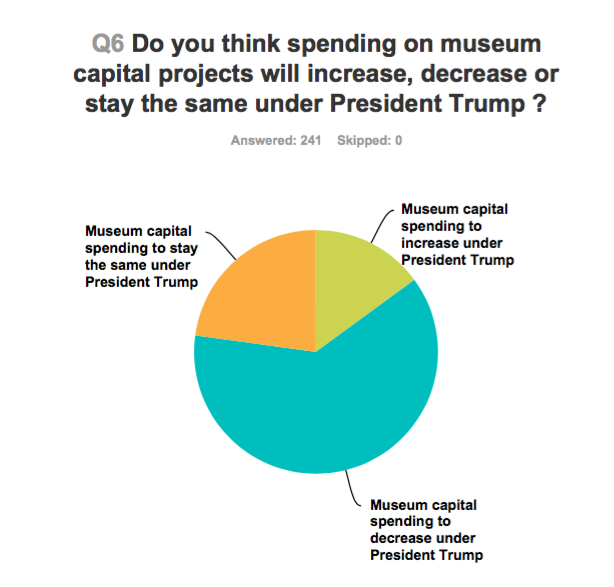 I think Trump will help put more money into the economy which will make more money available for spending at museums and on museum exhibits. I think it could open up new avenues for broader exhibits.. I believe the election of Donald Trump may produce sporadic and valiant attempts at dissent in museums, but the vast majority of museums will be very cautious, will self-edit, with an overall chilling effect on content when it is politicized, rightly or wrongly. I see diminishment or outright elimination of federal government grants for museums under an archconservative administration and congress. Until there’s evidence that the economy is turning around, museum business models should remain static. I dont see it as a major impact other than perhaps with the moratorium loosened on mining-museums that have mineral rights may see an increase in revenues. We are well connected with the Museum community. One of our close friends just committed a very large sum of money to support a new diversity and inclusion exhibit – they met with the director within 48 hours of the election. Progressives realize that they have to now do it themselves, and I see this occurring everywhere I look, both in theory and in actual checks being written. I do not think he influences Museum decisions at all. Some museums leadership might push personal preferences and agendas, but that could happen with either candidate. Local and regional influences probably have significantly more impact than national elections. Trump does not have any social and cultural look out. President Trump has many other problems and Museums will stay stabile. The only museum that would ever benefit from a President Trump is a Trump museum. The government’s influence will hurt museums and their funding. It is so hard to predict the future given his mercurial temperament. Softening of his words since the campaign followed by some of the perfectly awful transition team and cabinet posts that have been announced give me pause but I really think that the educational and intellectual life of this country will go on. It simply has to. Museum people are so widely varied. There are museums about anything and everything. We would have to have an extremely oppressive culture to restrict what we save and want to show off, but that funding issue will always be with us. Maybe he will make donating to museums for a tax break, more mainstream and get rid of some concerns that prevent collectors from doing so currently. Otherwise, it will be business as usual. Whether or not individual and corporate donations go up or down will depend on changes made to the tax code for charity giving. It appears as if the amount of $ some can give and claim on their taxes will be decreased. If this happens there will be a definite decrease in giving. Also, since I work in a childrens science museum we are concerned about specific issues with this presidency particularly his feelings on global warming. I hope that museum content will be more progressive, but my fear is that organizations will respond to corporate funding and social pressures, therefore becoming even more conservative in terms of content. My hope is that individual giving will increase and that museums will be brave enough to encourage and solicit progressive art and content. One could argue that artistic expression flourishes under repressive political structures, so I hope that museums will be at the forefront of capturing and developing progressive and radical arts. If he changes the amount of tax deductions on charitable giving – big donors. I think it will make large capital improvement donations harder to raise. Museums should stay true to their subject matter. Progressive or Conservatism shouldn’t affect content, unless a museum decides to be political instead of what they should be. I can’t understand the need to flavor every part of our lives with politics. I would be mortified to think that a BOD would allow their personal agendas to corrupt the content of a museum’s exhibition. I think we will see more travel and spending by tourists as our economy gets better and more jobs are created. As a historian I can think of only a few dramatic elections with massive changes–the vast majority of elections may seem exceptional but really life pretty much goes on much the same as it had before. I think that there will be a movement within the museum world to more vocally advocate for the telling of stories (particularly of people of color, indigenous communities etc.). I also think that the museum world will be more poised than ever to be both a refuge and resource for accurate information. At least that’s what we’re talking about here. 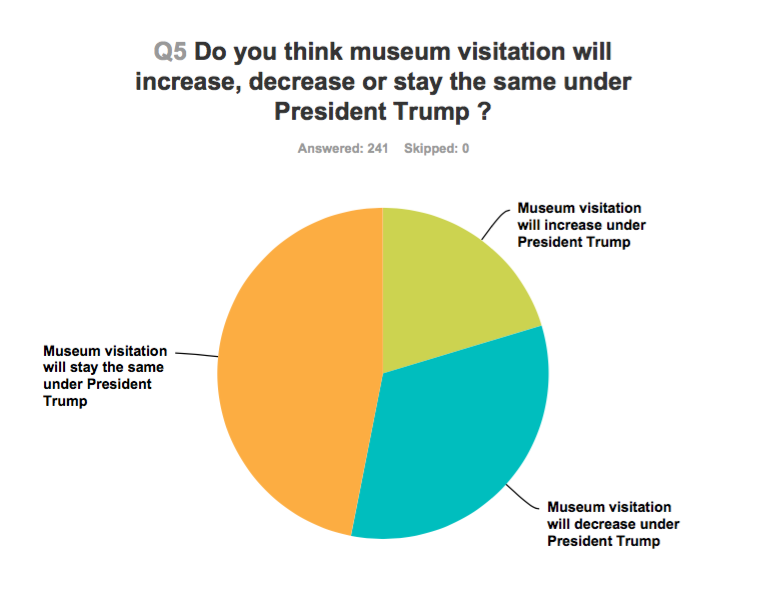 The one area that is a question mark is perhaps visitation – if the economy struggles, people may not have the household resources to make museums a priority experience. I hope the museum community can maintain a hopeful, forward-thinking and collaborative attitude over the next four years. It’s essential we don’t allow political trends to distract us from our mission of progressive and inclusive informal education in STEAM subjects. this is the time for museums to play a vital role in the sanity of the world. Leading museums such as the Smithsonian and National Park Service I believe will suffer most in this political climate. I think–I hope–that museums will work to become safe places for those who feel endangered by Trump’s election and his supporters.